For something a little out of the ordinary, try this amazing oyster dressing recipe. You won’t believe how amazing it tastes. This Easy Oyster Dressing recipe has been sponsored by Sister Schubert’s. Until I was a teenager we moved around a lot with the Air Force and Thanksgiving dinner wasn’t very eventful. Neither of my parents really cooked and the idea of making a huge turkey dinner for just three people seemed like more trouble and work than it was worth. So most of my memories as a child on Thanksgiving involved some sort of restaurant. Thanksgiving dinner forever changed at 13 when my grandparents came to live with us. They were both used to a full spread of holiday dishes and my grandma had no problems getting up before the sun to get the turkey prepped and in the oven. As I said, my mom wasn’t much of a cook so my grandma took it upon herself to teach me how and I quickly became her Thanksgiving sous chef. My grandma was a firm believer in working smarter, not harder. Especially on Thanksgiving. 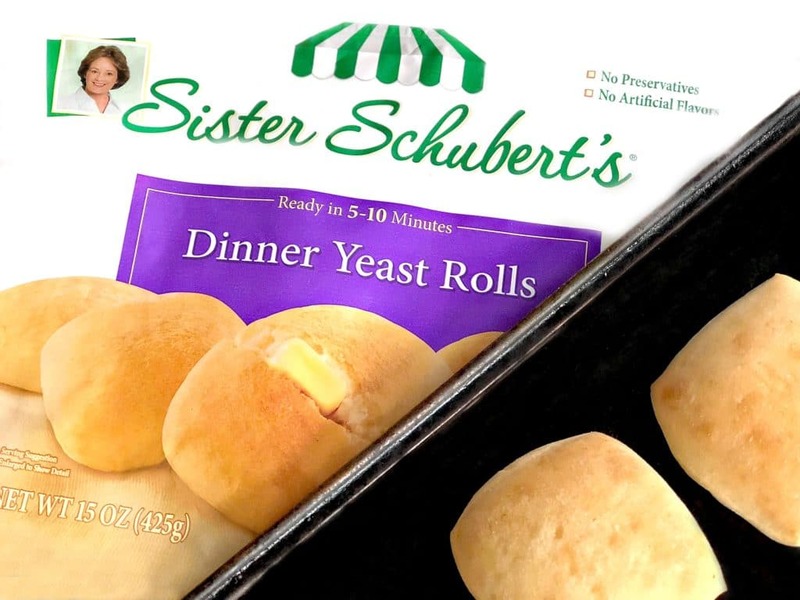 She wasn’t about to waste precious time making homemade rolls when she could get the same taste, faster and easier by popping Sister Schubert’s Dinner Yeast Rolls in the oven 5-10 minutes before dinner was ready. She would time things just right so that as people started sitting down at the table, the warm basket of Sister Schubert’s Dinner Yeast Rolls would appear. Influenced by other grandma and my Florida roots, I combined our family tradition of Sister Schubert’s Dinner Yeast Rolls with a Southern Thanksgiving staple in this easy oyster dressing recipe. My uncle’s a fisherman, so when the entire family gets together for the holidays, seafood is usually found and I would assume there was probably some seafood at the first Thanksgiving as well! How do you make oyster dressing? My oyster dressing recipe is almost completely homemade. I took a few shortcuts by using cornbread stuffing mix and the frozen dinner rolls. But everything else is pretty fresh. You can read the complete recipe on the printable recipe card below. To make oyster dressing, you need a can of oysters and some oyster juice. You’ll brown the onion, celery, and garlic in some butter first. Then you’ll boil chicken broth with the oyster juice. This is what gives it so much flavor! After that starts to boil, remove it from the heat and add cajun seasoning (for a really amazing kick! ), stuffing mix and the oysters and place everything over some cubed cooked dinner rolls. Mix this up just a bit with a fork – but don’t over mix it. 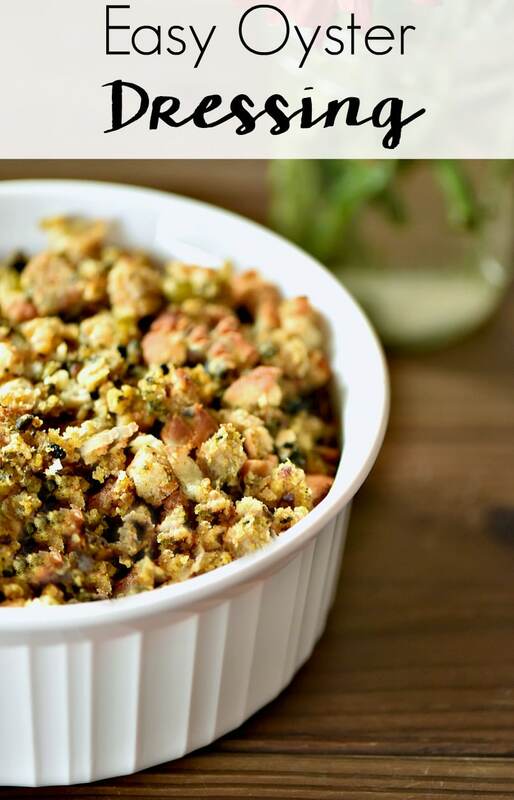 What you have is a powerful Thanksgiving side dish everyone will love. 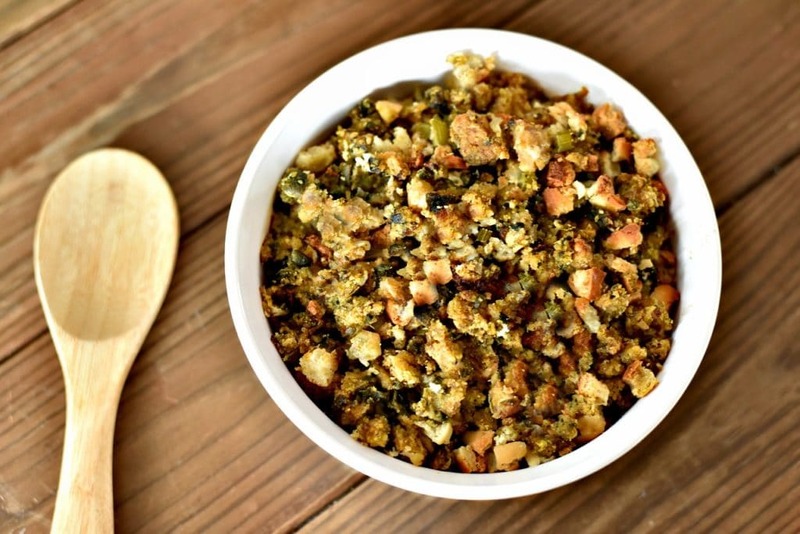 Literally, stuffing is the bread mixture that you stuff inside the turkey. If you make it as a stand-alone side dish, it’s a dressing. Ready for the recipe? Here’s my southern Thanksgiving side dish – easy oyster dressing. Brush tops of Sister Schubert's Dinner Yeast Rolls with butter and place in preheat oven to cook for 5-10 minutes or until they're perfectly golden. Chop Sister Schubert's Dinner Yeast Rolls into small cubes and set aside. Cook onion in melted butter for 3 minutes, then add garlic and celery. Continue cooking until the mix is tender, yet still crisp. Meanwhile, pull oysters apart with your fingers and set aside. Add broth and oyster juice to pan and bring to a boil. Add oysters, cornbread stuffing and Cajun seasoning to pot and remove from heat. Mix lightly with fork but be careful not to overmix. Evenly spread Sister Schubert's bread cubes on top of oyster dressing and bake in oven for 30 minutes. 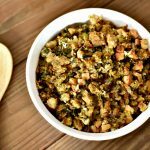 Simplify your Thanksgiving dinner with this easy oyster dressing recipe and Sister Schubert’s Dinner Yeast Rolls. Sister Schubert’s are frozen to naturally preserve the homemade taste of real ingredients and finished off flavor from home and available at Walmart. If you need some more Thanksgiving ideas, here are some of my favorites.